Ethnocentrism or Cross-National Learning? (Catherine Durnell Cramton and Pamela J. Hinds); Protestant Relational Ideology: The Cognitive Underpinnings and Organizational Implications of an American Anomaly (Jeffrey Sanchez-Burks); Isomorphism In Reverse: Institutional Theory as an Explanation For Recent Increases in Intraindustry Heterogeneity and Managerial Discretion (Donald C. Hambrick, Sydney Finkelstein, Theresa S. Cho, and Eric M. Jackson); The Red Queen: History-Dependent Competition Among Organizations (William P. Barnett and Elizabeth G. Pontikes). 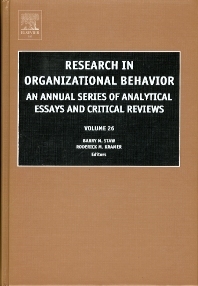 This twenty-sixth volume of Research in Organizational Behavior presents a set of well-crafted and thoughtful essays on a series of research topics. They range from efforts to redirect the study of leadership, to analyses of interpersonal relationships, to considerations of cross-cultural issues in organizing work, to discussions of institutional and environmental forces on organizational outcomes. Each of these essays includes a thorough review of the relevant literature, and more importantly, pushes that literature forward with new conceptual analysis and theory. In short, these essays continue the spirit of "rigorous eclecticism" that has exemplified the annual publication of ROB. As a collection, this year's set of essays provides a healthy advance for the field of organizational behavior. They are examples of serious scholarship that extend and challenge our current thinking about organizations and the behavior of its participants. Many of these chapters will take their place among the best presented by the Research in Organizational Behavior series. • Subgroup Dynamics in Internationally Distributed Teams: Ethnocentrism or Cross-National Learning?